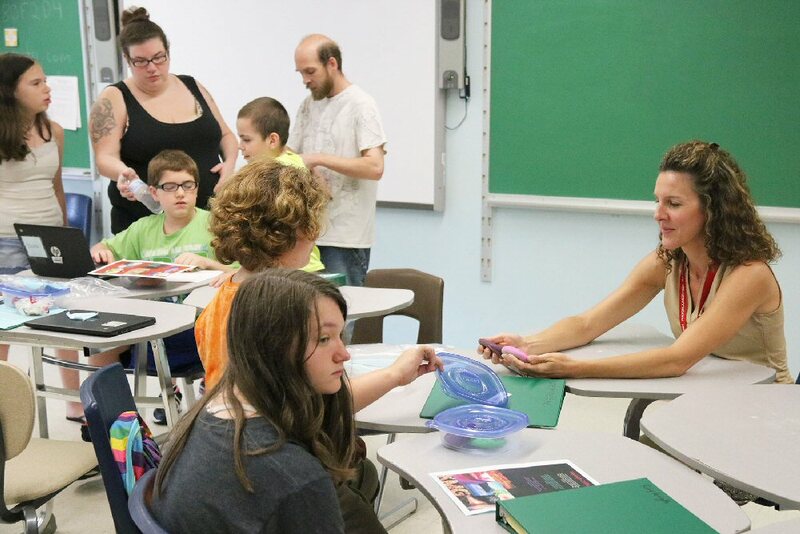 Incoming seventh graders to the Fulton Junior High School present their Fulton Community School Summer School program progress to their families and FJHS Assistant Principal Elizabeth Stoddard, right, during the program’s recent culmination event. FULTON – The Fulton Community School Summer School program was sweet success. The students explored the world of chocolate, both locally and worldwide, as they experienced math, science and humanities lessons, mixed with field trips and hearing from guest speakers. Tammy Sheldon, the summer program’s administrative director, said students learned all about where chocolate comes from, how it’s made, candy drops during the Cold War, child labor laws and the five senses throughout the amplified chocolate curriculum taught student. Representatives from Stone’s Home Made Candy Shop in Oswego also stopped by to guide the students in making a raisin, nut and chocolate bark. June Star test scores were utilized as base assessment tools and students filled out weekly progress reports which indicated student-specific targets and goals. All progress was measured against New York State learning standards. During the program’s culmination event at the Fulton Junior High School, students accepted perfect attendance, exemplary attendance and participation awards from staff members and enjoyed multiple samples of chocolate.